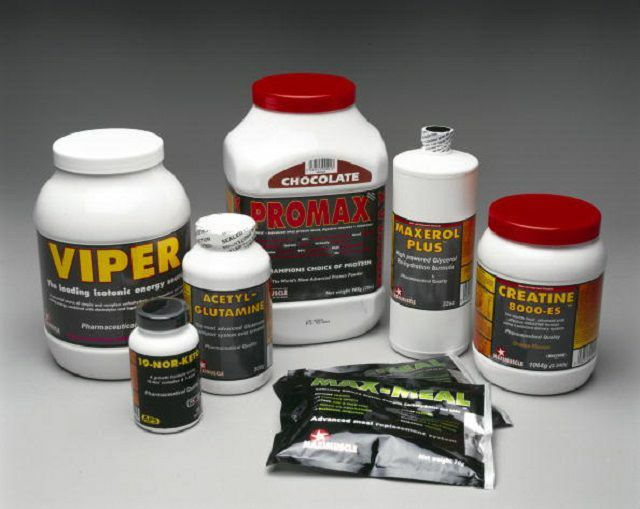 You may be looking to use bodybuilding supplements for weight training sports and fitness activities. There's no shortage of choices given all the new outlets to purchase products that create faster muscle gain. The hard part is finding out which ones work and how much to take safely. Here is a diverse list of supplements to consider. Creatine is a naturally occurring compound found in muscle in large amounts. Creatine monohydrate is the supplement form and combines is a combination of the amino acids arginine, glycine, and methionine. Creatine drives the important creatine phosphate energy pathway, which is important in high-intensity activity such as weightlifting. Creatine can improve body bulk and training performance in high-intensity activities. Be aware that not everyone responds to creatine supplementation and 30 percent of users may not see any improvement. Women may not benefit as much as men. In weight training, increased strength, bulk, and fat loss are reasonably consistent results. Safety. At the recommended dose of 3 grams/day creatine seems safe to use over the long term in studies published so far. Isolated adverse effects are reported but these may be as a result of poor compliance with the recommended amount. These complete proteins include all of the essential amino acids that the body cannot produce itself. Different proteins, such as whey and casein, egg and soy have different absorption rates. Whether you should favor one over another for muscle building is still a subject of popular and scientific debate, although whey protein isolate, a more rapidly absorbed protein, has some support from various scientific studies. For protein powders, assess the value by checking out the protein listed on the label. Combined with resistance training, sufficient protein consumption along with an appropriate diet can lead to increased muscle and reduced body fat. You should read more about The Bodybuilding Diet for supplement timing issues before and after training. Safety. No safety issues are expected when you ingest protein powders within reasonable limits. Excess protein consumption may not be safe for people with kidney disease. Multivitamin supplements may help you reach the recommended daily intakes for vitamins and minerals if you have a less than ideal diet, travel impairs your diet, or strenuous exercise increases requirements. I consider a multivitamin good insurance in these circumstances against possible deficiencies. Choose a reputable brand. You should choose a good all-around supplement with a balanced formula. Antioxidants in the diet protect against natural and synthetic chemical fragments called free radicals that are a part of daily living. Lifestyle challenges may increase your requirements for antioxidants. Vitamin C and E are the main antioxidants in the normal diet although many other plant nutrients contribute to this effect. Pollution, stress, smoking, strenuous exercise, and illness may increase your requirements for antioxidant protection. Safety. Excess quantities of antioxidants may produce a ‘pro-oxidant’ effect, which is the opposite of what you would take these supplements for. The Australian Institute of Sport recommends that antioxidant vitamin supplements only be taken for a period of a few weeks while the body adjusts to stressful circumstances. Excess vitamin C may promote excess iron absorption, which may not be healthy for everyone. Women who train hard and reach low body fat levels, say under 10 percent, may be at risk of losing their periods as a result of hormonal disruption to estrogen production. Exercise-induced estrogen declines can result in bone loss in a way similar to that which occurs at the menopause. Loss of periods from athletic training is not uncommon but does require that you see a doctor, or better still, a sports physician and sports nutritionist to assess what is required to address the problem. Calcium supplements may be a part of the solution if bone health is likely to be affected. Zinc is important to produce the male hormone testosterone and in building the immune system. Magnesium is an essential component of the nervous system and for maintaining heart health. Both have a range of important biochemical function. Zinc and magnesium are often marketed to bodybuilders in combination in a supplement called ZMA. Zinc is in whole grains, seeds, nuts and particularly meat and oysters. After years of research, no evidence exists to show that either mineral offers bodybuilding or athletic performance enhancement in excess of the recommended dietary requirements. Safety. Zinc can be slightly toxic in excess and zinc can also affect absorption of copper. I see no reason to exceed 20 mg/day in supplements of zinc. Iron is the mineral in the body essential for producing hemoglobin, a blood protein that transports oxygen in the body. It is easy to see how important iron is for people who exercise. Safety. Iron overload may cause a disease called hemochromatosis in some susceptible people. Iron supplements should only be prescribed by a doctor, and for athletes or those who train heavily, a sports physician combined with a sports dietitian may be preferable. Be sure to take care with this because iron supplements should not be taken casually. Iron supplements may cause constipation and gastric upset in some people. Electrolytes derive mainly from minerals in the diet and they maintain fluid balance and assist the nervous system to perform muscle contractions. Electrolytes are sodium, potassium, magnesium, calcium and chloride, bicarbonate, phosphate, sulfate. Exercisers are particularly dependent on sodium and potassium balance. Carbohydrates are important for fueling exercise, including vigorous weight training, and in post-exercise energy replacement nutrition. Carbohydrates, mostly sugars, are formulated in sports drinks with electrolytes such as sodium chloride and potassium and sometimes magnesium. Sports drinks can be useful in weight training where sessions proceed beyond an hour of high-intensity exercise or at the end of such sessions where rapid replacement of muscle glucose is good practice. Caffeine is the naturally occurring alkaloid and stimulant in coffee, tea, cocoa, guarana, cola and other plant product beverages. A strong cup of brewed coffee will give you about 100 milligrams of caffeine, instant coffee around 80 milligrams, often less, and tea down around the 40 milligrams. It varies from product to product and how you prepare the drink. Safety. In general health terms, most medical opinion is that up to three cups of coffee a day are not harmful, and may even have some benefits, although some people respond to the stimulant properties with more problems than others. Heart palpitations and restlessness are experienced by some caffeine drinkers. In pregnancy, one or two cups each day are thought to be without harm to the fetus. Contrary to the sound of the name, glucosamine is not a glucose replacement drink but a naturally occurring compound that has received publicity and wide support as a supplement for the relief of arthritis pain and possible prevention of further joint damage. Glucosamine has been popular with sports people of all types, including weight trainers, particularly for knee arthritis and pain. Glucosamine seems to be safe to use. Glutamine and beta-alanine are amino acids and HMB, beta-hydroxy-beta-methyl butyrate, is a byproduct of leucine, another amino acid. Promoting individual amino acids, the building blocks of protein, to enhance performance in the strength sports has been a particular focus of supplement manufacturers over the years. To date, the evidence for any advantage has been mixed and mostly unimpressive. HMB supplementation is claimed to build muscle size and strength and promote fat loss in conjunction with a strength program. Studies of HMB have shown some benefit to strength athletes in building muscle bulk but the benefits are relatively small and the cost of HMB is high. The effective dose seems to be 3 grams/day divided into 1 gram three times a day. Probably not worth taking. Beta-alanine is the new guy on the block and has not been evaluated sufficiently in my view. It may provide some advantage in high-intensity sports like weight training but it’s much too early to know that it does. Some early studies are flawed. Save your money or try creatine instead. Arginine, and leucine, valine, and isoleucine, the branched-chain amino acids, are also promoted and sold as beneficial supplements for strength trainers and athletes. As individual products, there is no evidence of benefit beyond their role in complete proteins. Leucine may be worth watching for possible benefit with further evaluation. If you are a ranked athlete, don't put anything in your mouth that could fail you in drug testing. For amateurs, don't believe everything you read in the muscle mags or on the internet. Much independent testing is required to verify the value and safety of supplements. Does your supplement recommend that efficacious dose on the label? Can you trust the supplement company to always deliver that amount in its product? Can you trust the supplement company not to include unsafe or illegal additional products intentionally or unintentionally in the product? Maughan RJ, King DS, Lea T. Dietary supplements. J Sports Sci. 2004 Jan;22(1):95-113.Kreider RB. Dietary supplements and the promotion of muscle growth with resistance exercise. Sports Med. 1999 Feb;27(2):97-110.Kerksick CM, Rasmussen CJ, Lancaster SL, et al. The effects of protein and amino acid supplementation on performance and training adaptations during ten weeks of resistance training. J Strength Cond Res. 2006 Aug;20(3):643-53.Update of Cochrane Database Syst Rev. 2001;(1):CD002946. Glucosamine therapy for treating osteoarthritis. Cochrane Database Syst Rev. 2005 Apr 18;(2):CD002946.AIS Sports Nutrition - AIS Sports Supplement Program 2007. Can a Bodybuilder be Competitive as a Vegan?